As much as drug culture was having an impact on rock music in the 1960s and ‘70s, it was also altering the universes of comic books, and not just the undergrounds. The late Silver and Bronze eras were a mighty cosmic time for some costumed crimefighters. One such acid casualty was Marvel Comics’ CAPTAIN MARVEL (not to be confused with the Big Red Cheese). 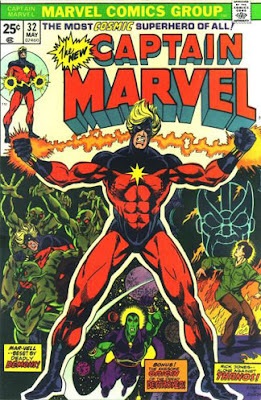 Debuting in MARVEL SUPER HEROES #12 in 1967 and quickly graduating to his own series, Captain Mar-Vell was a member of the alien Kree race who was sent to scout out Earth for possible conquest, but came to love our little planet (much like the Silver Surfer) and rebelled against his masters. Designed by Gene Colan, the original Mar-Vell was clad in a rather unique helmeted white and green outfit. When sales proved less than spectacular, writer Roy Thomas revamped the character into a sci-fi pastiche of SHAZAM!, as a Negative-Zone-stranded Mar-Vell now shared the persona of teenager Rick Jones (former sidekick of the Incredible Hulk and Captain America), who could switch atoms with the hero by banging his “nega-bands” together. Artist Gil Kane redesigned the costume into a red-and-gold, starburst-emblazoned supersuit. The changes weren’t enough to save the series, however, and CAPTAIN MARVEL was cancelled with #21 in 1970. But two years later, the comic was revived. Writer Gerry Conway and artist Wayne Boring (best known for his 1950s barrel-chested Superman) continued the tale for a handful of issues until #25, when young artist Jim Starlin began penciling the book, soon moving to plotting, then scripting the whole shebang by #29. The concept of the strip was again changed, as a cosmic entity named Eon released Mar-vell from the Negative Zone and gave him the small task of protecting the entire universe (especially the trippier parts of it). Under Starlin’s watch, Captain Marvel became a trippy, outer space philosopher, searching for meaning while battling the death-obsessed Thanos. Art-wise, Starlin used Steve Ditko’s surrealist space-scapes from DR. STRANGE as a launching point, giving it an acid rock twist that the conservative Ditko probably found offensive. Additionally, Starlin made Mar-Vell’s hair longer (and sadly changed its color from its original silver to a more youthful blonde). 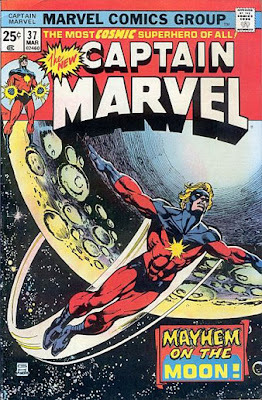 This “most cosmic superhero of all” (as the covers blurbed) blew my little adolescent mind just a bit (as did Starlin’s WARLOCK, coming someday to Bronze Beauties), and while CAPTAIN MARVEL was never one of my favorite books, it is a great example of how far-out superhero comics got in that era. Starlin left the book with #34, but returned to kill off the character in Marvel’s first graphic novel, 1982’s THE DEATH OF CAPTAIN MARVEL. Here are the covers to #32 (May 1974) by Jim Starlin & Klaus Janson and #37 (March 1975) by Gil Kane & Janson. COMING IN TWO WEEKS: The first in a series of five weekly Bat-Bronze Beauties leading up to the release of THE DARK KNIGHT!